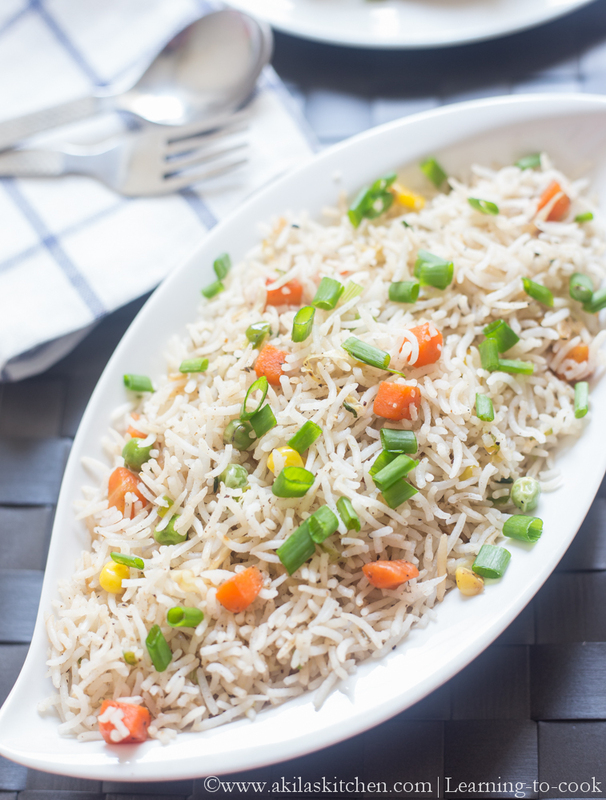 Vegetable fried rice recipe with easy step by step instructions for easy leaning. 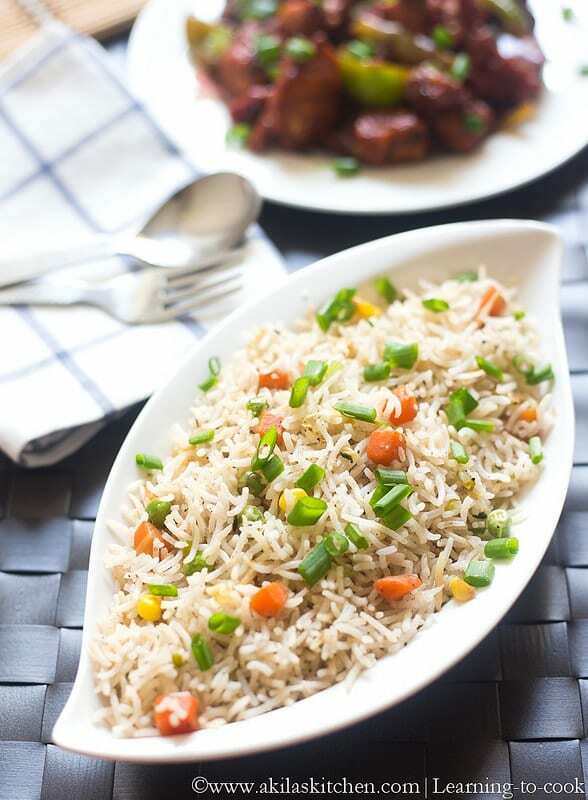 Vegetable Fried Rice or Veg Fried Rice is one of my favorite rice dish in any Chinese restaurant. Even in my office canteen I used to order veg fried rice if i forget to pack my lunch. I knowingly forget to get this fried rice 😜 sometimes. Mostly they used to prepare the veg fried rice with egg. But I used to tell them to prepare only with vegetables and sprouts. I felt very tried to explain to them on first time. But later they used to prepare by themselves when they see me ☺☺. I prepared Chilli chicken as the side dish for this fried rice. Ok now let’s go to the recipe of veg fried rice. 1. Wash the vegetables and keep it ready. Cook the rice with a pinch of salt and star anise and mace to 75%. Do not use more spices. 2. Filter out the water and cool down the rice as we want a grainy texture and not a mushy rice. 3. Now in a large skillet, add oil and when hot, add garlic. Fry for a minute. Add the vegetables and fry them in high flame. 4. Add sugar, so as to keep the colour of the veggies. 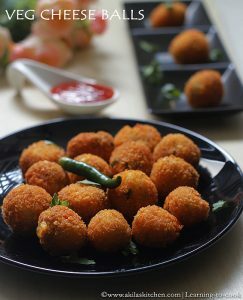 Finally add the bell peppers as we want to retain the crunchiness of the capsicum. 5. Add the pepper powder and the msg. Fry for a minute. Add the soya sauce and vinegar and salt for Chinese Style fried rice and add only vinegar and salt form the Indian style veg fried rice. (This tip I took from here). Keep frying the vegetables. 6. Add the rice and mix it. Check for the salt now as the soya sauce already contains the salt. If less add the salt. Keep frying the rice too in high flame so that we get the smoky flavor in the rice which is what we want in the fried rice. 7. 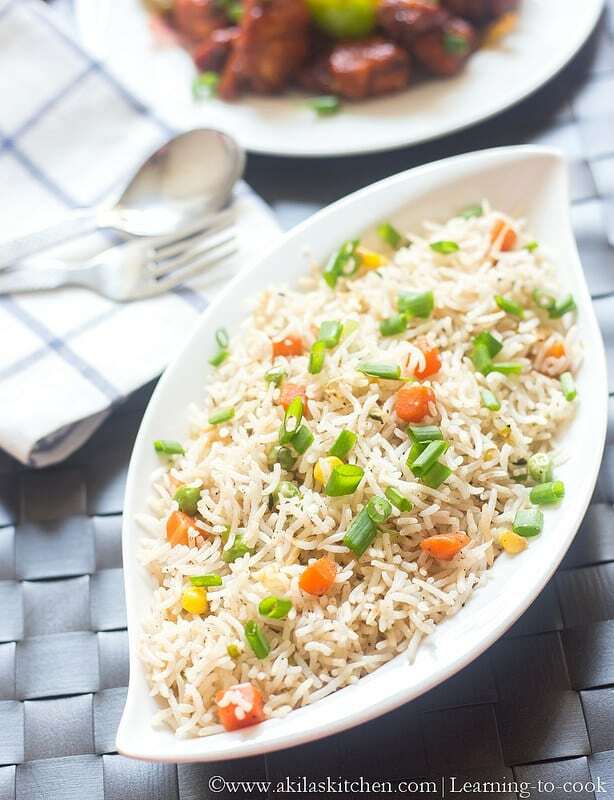 Yummy and tasty Vegetable Fried Rice is ready. 8. Garnish with spring onions and serve it. 2. After adding rice, you should fry the rice in high flame so only we get the perfect fried rice. 3. I did frying of the rice in batches as my skillet is small. 4. Try to use the light soya sauce as dark soya sauce change the color of the rice. 5. Soya sauce already contains salt so check before adding salt. Wash the vegetables and keep it ready. Cook the rice with a pinch of salt and star anise and mace to 75%. Do not use more spices. Filter out the water and cool down the rice as we want a grainy texture and not a mushy rice. Now in a large skillet, add oil and when hot, add garlic. Fry for a minute. Add the vegetables and fry them in high flame. Add sugar, so as to keep the colour of the veggies. Finally add the bell peppers as we want to retain the crunchiness of the capsicum. Add the pepper powder and the msg. Fry for a minute. Add the soya sauce and vinegar and salt for Chinese Style fried rice and add only vinegar and salt form the Indian style veg fried rice. (This tip I took from here). Keep frying the vegetables. Add the rice and mix it. Check for the salt now as the soya sauce already contains the salt. If less add the salt. Keep frying the rice too in high flame so that we get the smoky flavor in the rice which is what we want in the fried rice. 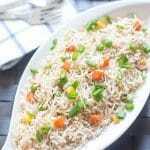 Yummy and tasty Vegetable Fried Rice is ready. Garnish with spring onions and serve it.